Asian style meals feature frequently in our meal plans, and we really enjoy trying new ones. 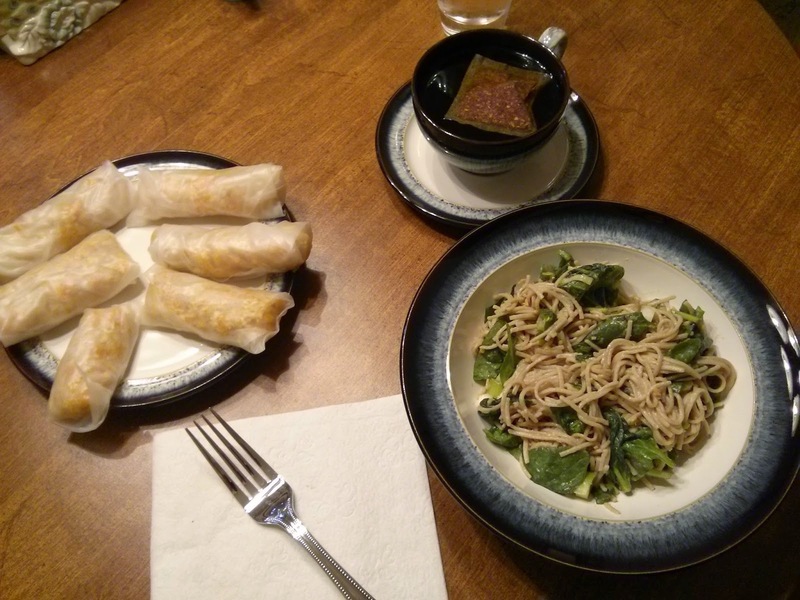 For this meal, we combined a previous favorite (Brussels sprouts spring rolls) with a new noodle recipe. For the spring rolls, I've found that the filling is so tasty that frying them is unnecessary, so we save ourselves a step and they're healthier too. The main dish was noodles with spinach and peanut sauce. Every ingredient in the peanut sauce is a winner for me (especially peanut butter), and despite what seems like a strange combination, as a whole it was very good. Do you have any favorite recipes for or dishes that include peanut sauce? Cook soba noodles (or other favorite noodles) according to package. In a bowl, combine shredded spinach and diced scallions. Once noodles are done cooking, drain and place on top of spinach. Let sit for 3-4 minutes then stir spinach into the noodles. In a separate small bowl, stir together ingredients for peanut sauce, taste, and adjust as desired. Pour peanut sauce over noodles and stir until well combined. Serve warm or refrigerate for a cold noodle bowl. Sprinkle with cilantro and sesame seeds to serve. You introduced us to soba noodles and we really like them.